Highway to Hell or Stairway to Cloud? At Zalando we run PostgreSQL at scale: a few hundred database clusters in sizes from a few megabytes up to 10 terabytes of data. What is a bigger challenge than running a high-OLTP multi-terabyte PostgreSQL cluster? It is the migration of such a cluster from the bare-metal data center environment to AWS. * Which instance type to choose: i3 with ephemeral volumes or m4/r4 + EBS volumes? * Should we give Amazon Aurora a try? * There is no direct connection from AWS to the data-center. How to build a replica on AWS and keep it in sync if VPN is not an option? * The database is used by a few hundred employees for ad-hoc queries; ideally, they should retain access through the old connection url. * How to backup such a huge DB on AWS? * We should be able to switch back to the data-center if something goes wrong. In this talk I am going to provide a detailed account of how we managed to successfully solve all these problems. 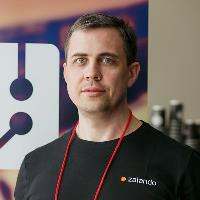 Alexander's everyday duty at Zalando is creation and maintenance of hundreds PostgreSQL clusters in sizes from several megabytes up to several terabytes of data. Occasionally he is contributing to different open source projects. He is the major contributors to the Patroni project.